Georges de la Tour (1593-1652), The New-born (1640s), Oil on canvas, 76 x 91 cm, Mus�e des Beaux-Arts, Rennes. Larger image. Georges de la Tour (French painter, 1593-1652), influenced by the dramatic chiarscuro of Caravaggio. Sir John Everett Millais (Pre-Raphaelite English painter and illustrator, 1829-1896) Christ in the House of His Parents (1849). Oil on canvas. Tate Gallery, London, UK. Another. 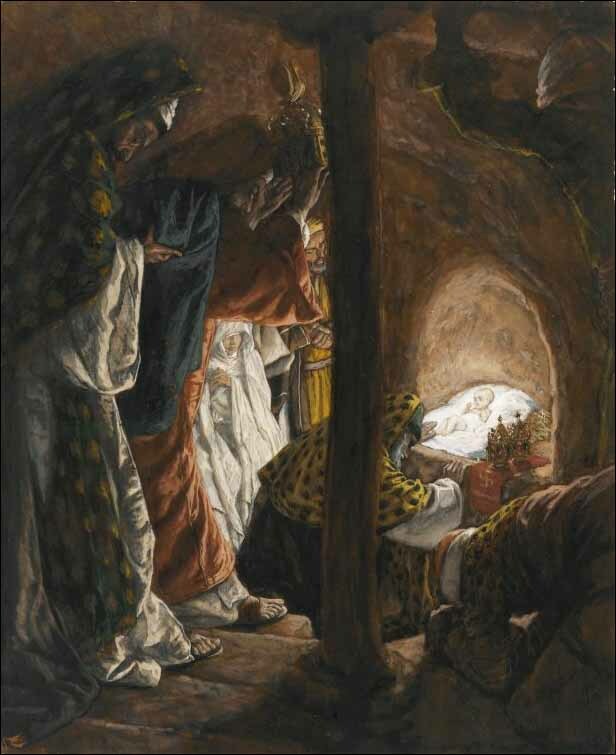 James Jacques Joseph Tissot, Christmas, Birth, Childhood of Jesus (French painter and illustrator, 1836-1902). 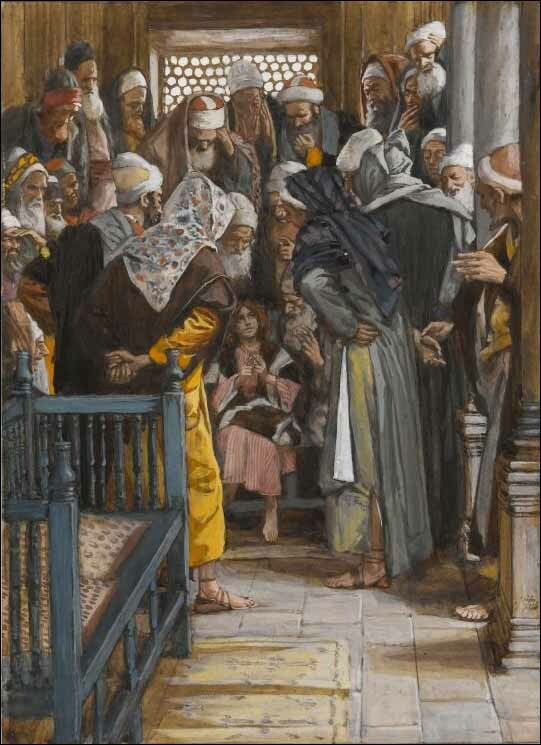 The Census in Bethlehem (1566), oil on panel, Koninklijk Museum voor Schone Kunsten (Royal Museum of Fine Arts). Rembrandt, "The Angel Appears to the Shepherds" (c. 1640-42),pen and brush drawing; 17.6 x 20 cm, Hamburg, Kunsthalle. Larger image. The Angel appears to the shepherds (c. 1640-42). Pen and brush drawing; 17.6 x 20 cm; Hamburg, Kunsthalle. Another. 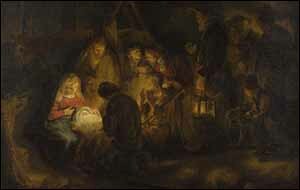 Adoration of the Shepherds (1646) Canvas, 65.5 x 55 cm, London, National Gallery. Another. 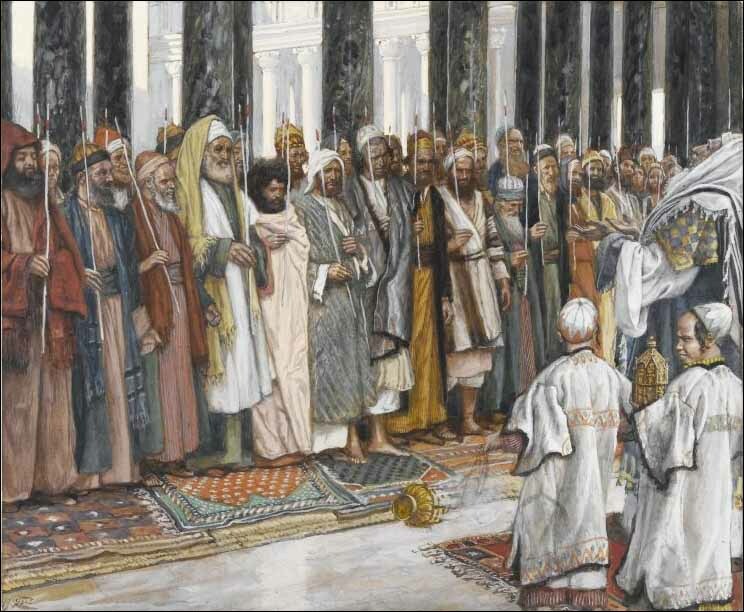 Simon in Temple (1669), oil on canvas. 99 x 78.5 cm; Nationalmuseum, Stockholm, Sweden. 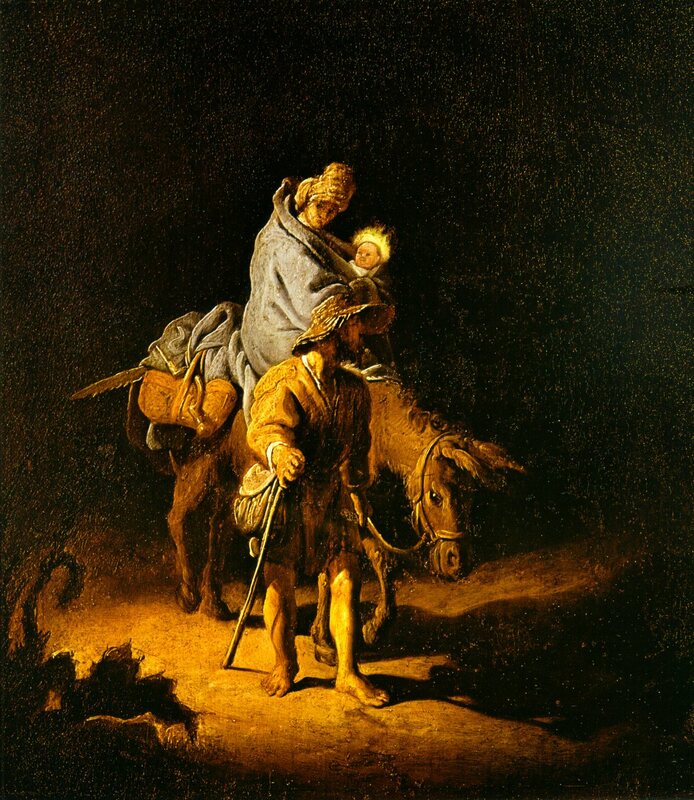 Rembrandt, Life of Christ collection, The Words Online. 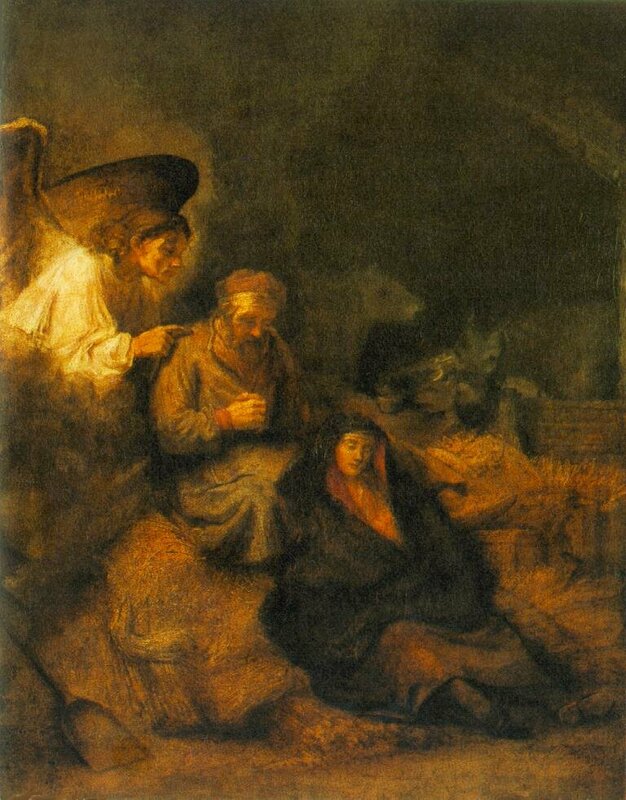 Rembrandt, The Adoration of the Shepherds (detail, 1646), The National Gallery, London. Larger image. Edward Lear (1812-1888), Bethlehem (1860s). Signed with mongram. Oil on canvas: 9 x 18 inches. Fine Art Society, London. The Mystical Nativity (c. 1500), Tempera on canvas, 108,5 x 75 cm, National Gallery, London. Large. Adoration of the Kings, 1564, 111 x 83.5 cm, Wood panel, National Gallery, London, UK. Sir Anthony Van Dyck (Flemish painter, 1599-1641), "Madonna della Paglia (Madonna of the Straw)" Galleria Nazionale d'Arte Antica, Rome, Italy. Larger image. 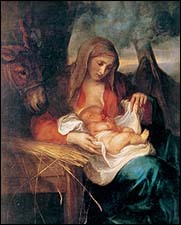 Sir Anthony Van Dyck (Flemish painter, 1599-1641), Nativity, in Time Magazine, Dec 13, 2004. "Madonna della Paglia," Galleria Nazionale d'Arte Antica, Rome, Italy. Adoration of the Magi (1433-34), Tempera on wood, Museo Diocesano, Cortona. St. Nicholas with Scenes from His Life, Latter half of the 16th century, 135 x 124. Egg tempera on lime wood, From the Church of the Nativity of the Virgin in the village of Liskovate (Poland). Lviv National Museum, # i-1181. William Hole, R.S.A., R.E. (British artist, 1846-1917). 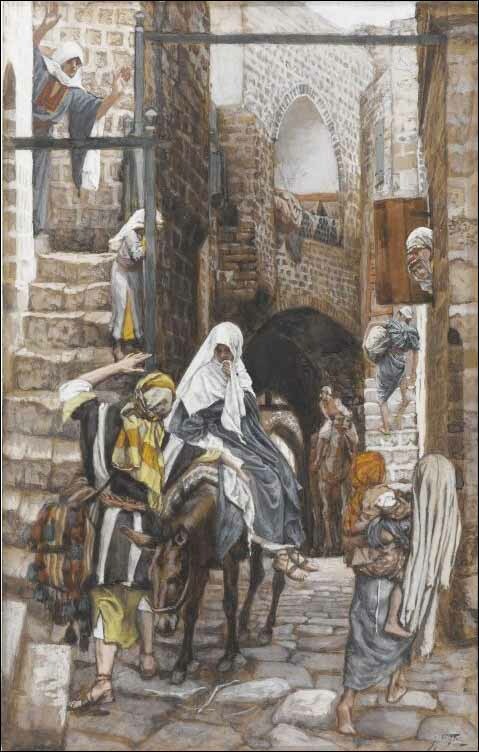 Erma Ferrari (illustrated by William Hole), The Life of Jesus of Nazareth (Simon and Schuster, 1958). also The Life of Jesus of Nazareth Portrayed in Colours. London: Eyre & Spottiswoode, 1908 and later, 8"x10". Or is this William Brassey Hole, RE, RSW, RSA (1867-1917). Piero di Cosimo (Florentine painter, 1462-1521), The Visitation with St. Nicholas and St. Anthony Abbot (c. 1490), oil on panel 184.2 x 188.6, National Gallery of Art, Washington DC. 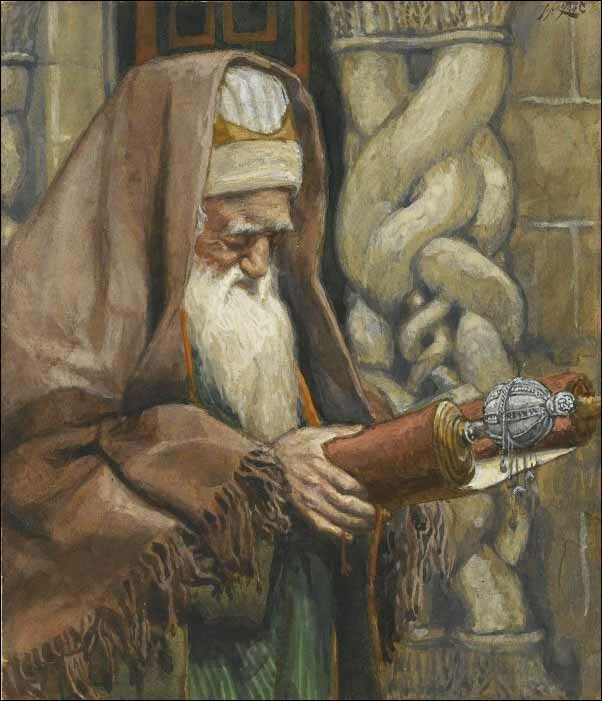 See left corner detail of St. Nicholas with 3 gold balls reading from Proverbs (Wisdom of Solomon). 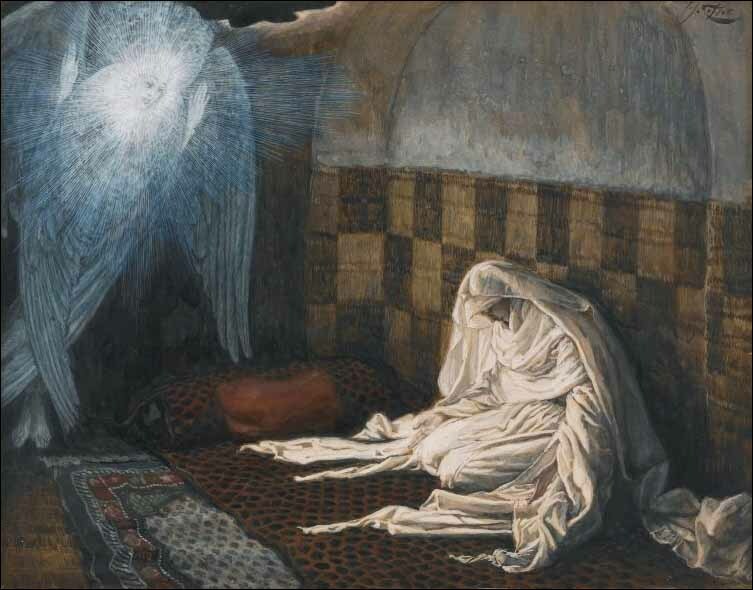 Henry Ossawa Tanner (1859-1937), The Annunciation of the Shepherds (c. 1895), Oil on canvas, 13 x 16 inches, Pensler Galleries. Benozzo Gozzoli, Vigil of the Shepherds (Palazzo Medici-Riccardi, Florence), fresco. Detail. 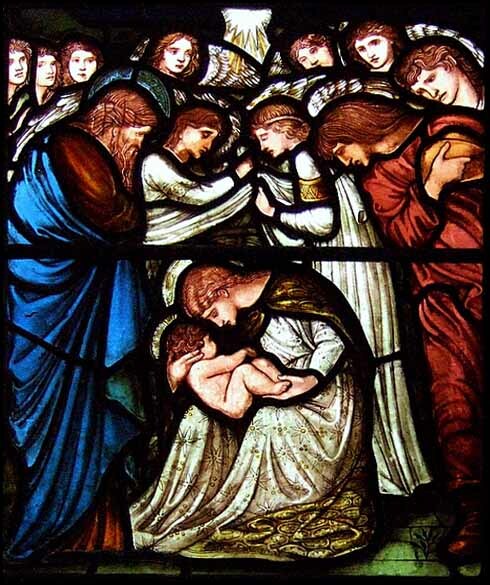 Edward Burne-Jones (1833-1898), "Nativity" (1875), William Morris stained glass window, St. Martins in the Bull Ring, Birmingham city center, south window. 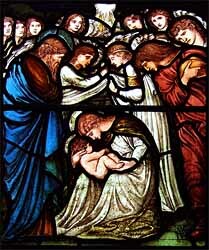 Angel appearing to shepherds, stained glass window, Lanercost Priory, Lanercost, Cumbria, UK, William Morris company. "Nativity" (1875), William Morris stained glass window, St. Martins in the Bull Ring, Birmingham city center, south window. 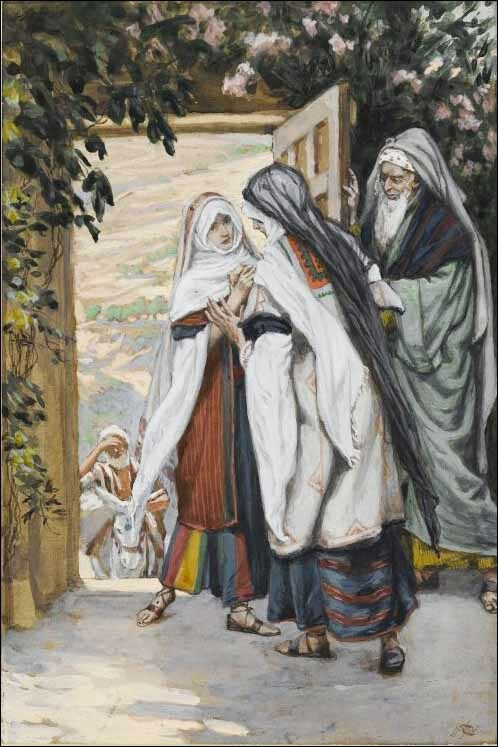 Annunciation to the Shepherds, oil on panel 33 x 45 3/8 in. Annunciation to the Shepherds, (1612-1652), Hermitage, St. Petersburg, Oil on canvas. 101x99.5 cm. 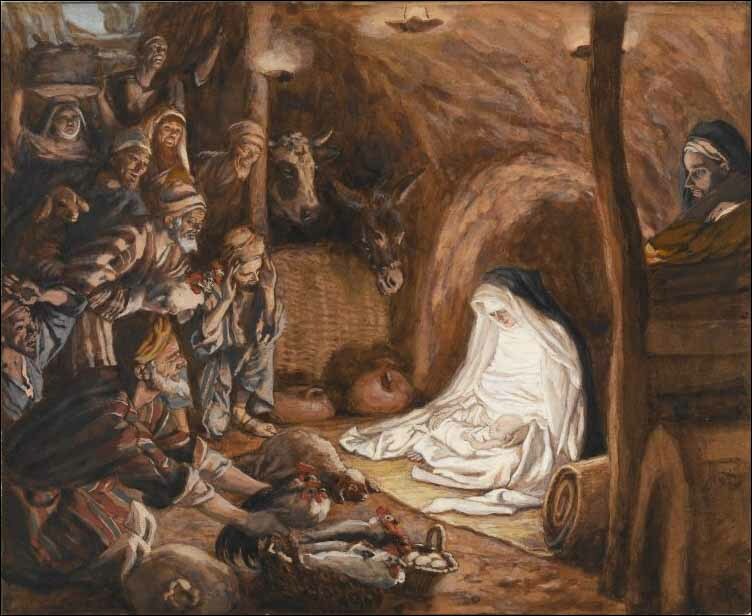 The Adoration of The Shepherds, Oil on panel, 98.0 cm x 75.0 cm. Tyne & Wear Museums. William Blake, Annunciation to the Shepherds, ink and watercolor, Whitworth Art Gallery, University of Manchester, Illustration to Milton's "On the morning of Christ's nativity". The Thomas set. 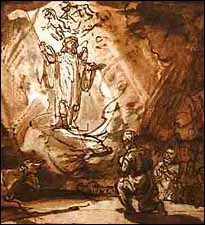 Rembrandt, The Angel appears to the shepherds (c. 1640-42). Pen and brush drawing; 17.6 x 20 cm; Hamburg, Kunsthalle. Another. Horenbout: Annunciation of the Shepherds, Hours of the Virgin, Fol.91r British Museum. Paul de Limbourg of Limbourg Brothers, Annunciation To the Shepherds (1411-16), Tres Riches Heures du Duc de Berry MS 65 in Musee Conde at Chantilly. Cornelis de Visscher (1619-1662), The Annunciation to the Shepherds (1655-57), etching. Royal Academy of the Arts, London. Adorazione del Bambino (Adoration of the Children, 1620) Galer�a de los Uffizi. Florencia. Italia. I think this is one of the most beautiful paintings of all, with the beautiful faces of children on the left, Mary on the right, overlooked by Joseph, background left. Andrea Mantegna (Italian, Paduan, born no later than 1430, died 1506), The Adoration of the Shepherds (shortly after 1450), Tempera on canvas, transferred from wood; Overall 15 3/4 x 21 7/8 in. (40 x 55.6 cm); painted surface 14 7/8 x 21 in. 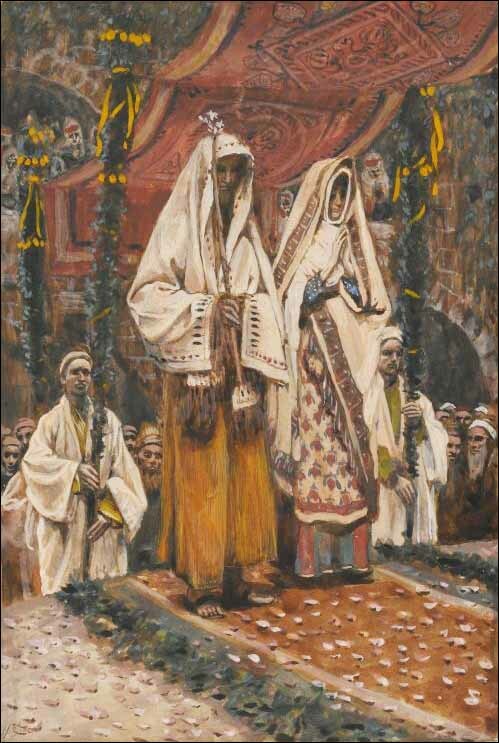 (37.8 x 53.3 cm). Metropolitan Museum of Art, New York. El Greco, Adoration of the Shepherds (1574-75), altarpiece. Pieter Fransz. 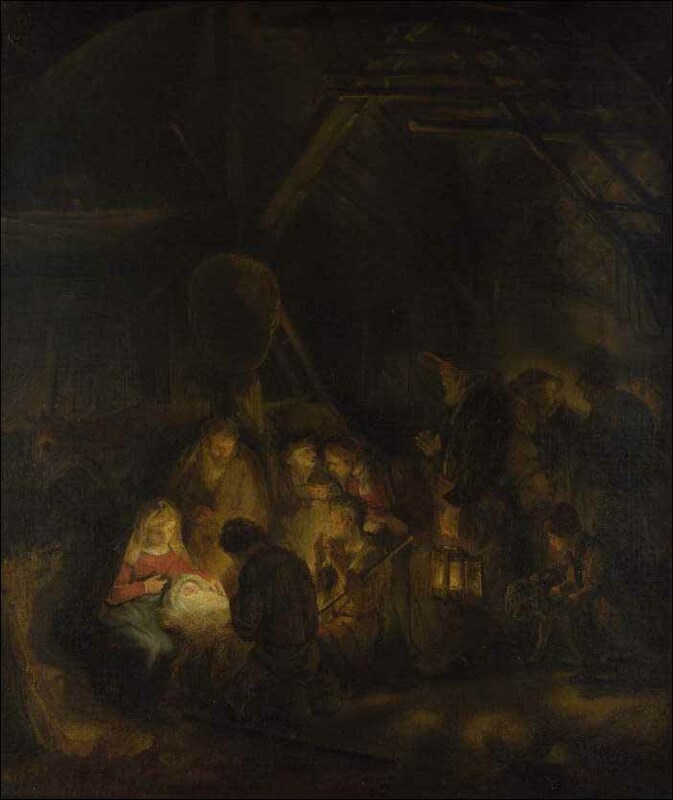 de Grebber (Dutch painter, c. 1600-1652), The Adoration of the Shepherds, c. 1625�30. Signed with initials: P.DG. 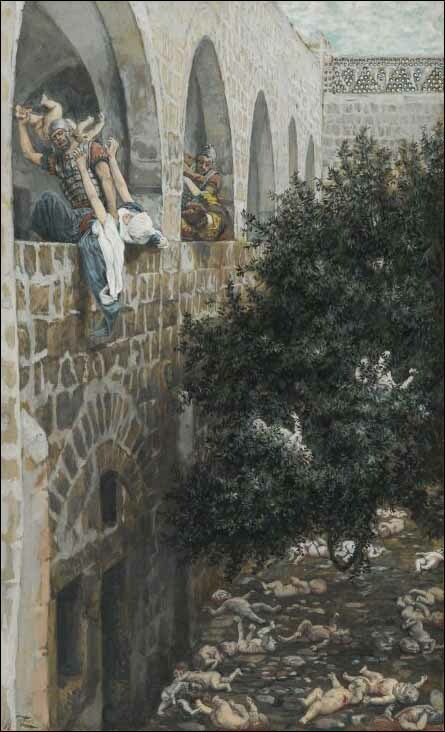 Oil on panel, Private Collection, Madrid; Nicholas M. Acquavella Galleries; BJU, 1962. 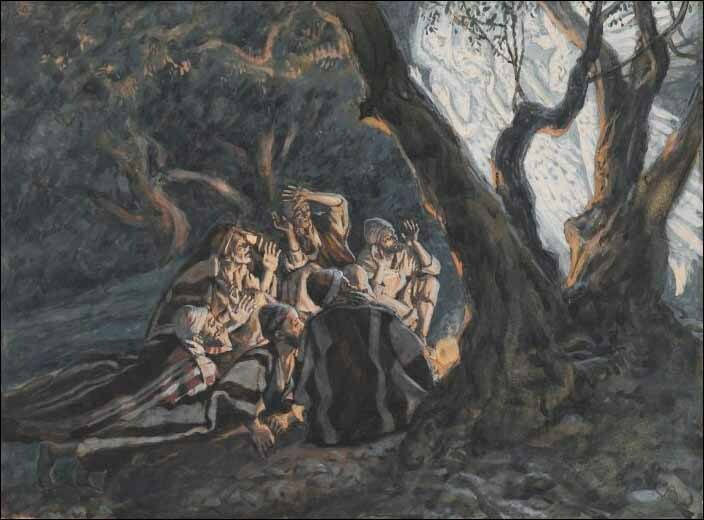 Shepherds Abiding in the Fields, National Historic Museum, Friederiksborg Palace, Hiller�d, Denmark. Manger Scene, oil on copper plate. 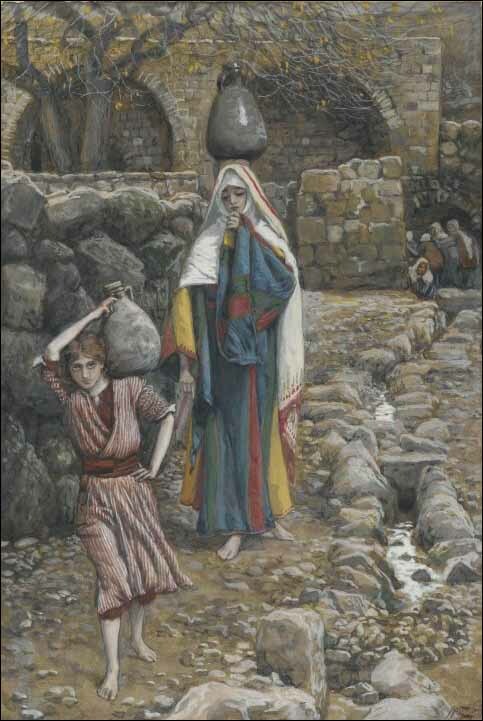 Mary and Elisabeth, oil on copper plate. 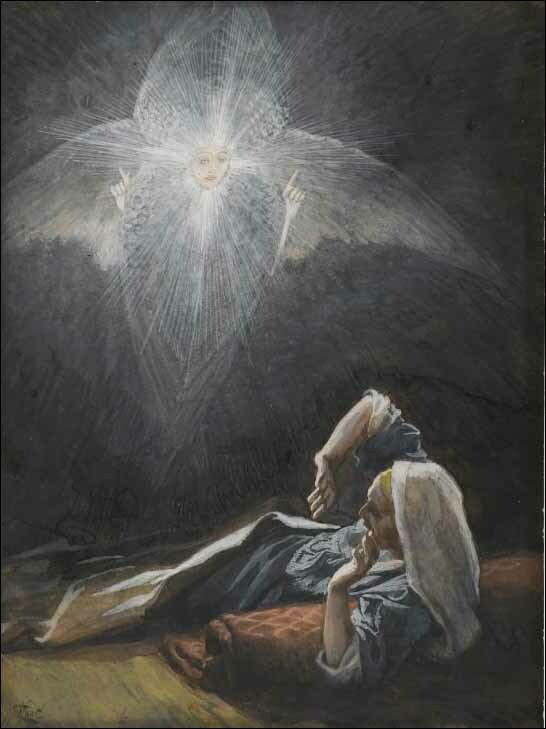 The Annunciation, oil on copper plate. Giorgione (Venetian 1477/78-1510), The Adoration of the Shepherds (1505-10), oil on panel 98.8 x 110.5. National Gallery of Art, Washington, D.C. 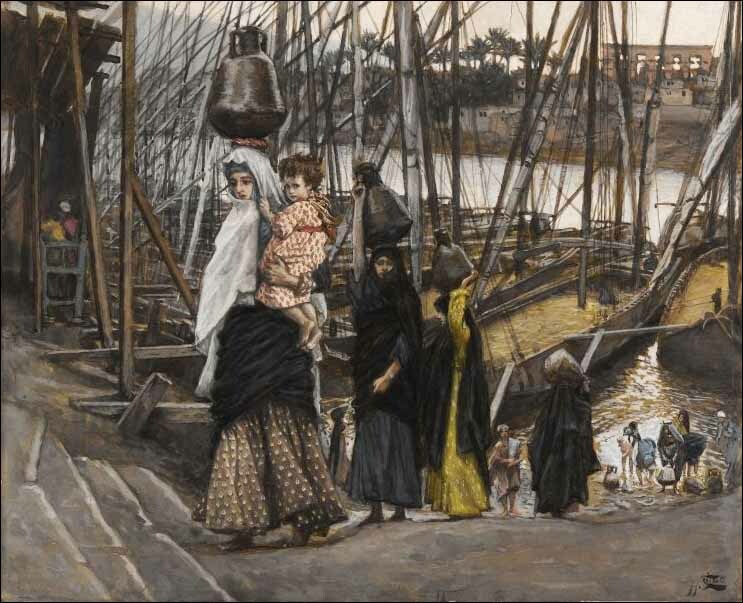 Detail on bottom right could be cropped for good composition of smaller picture. 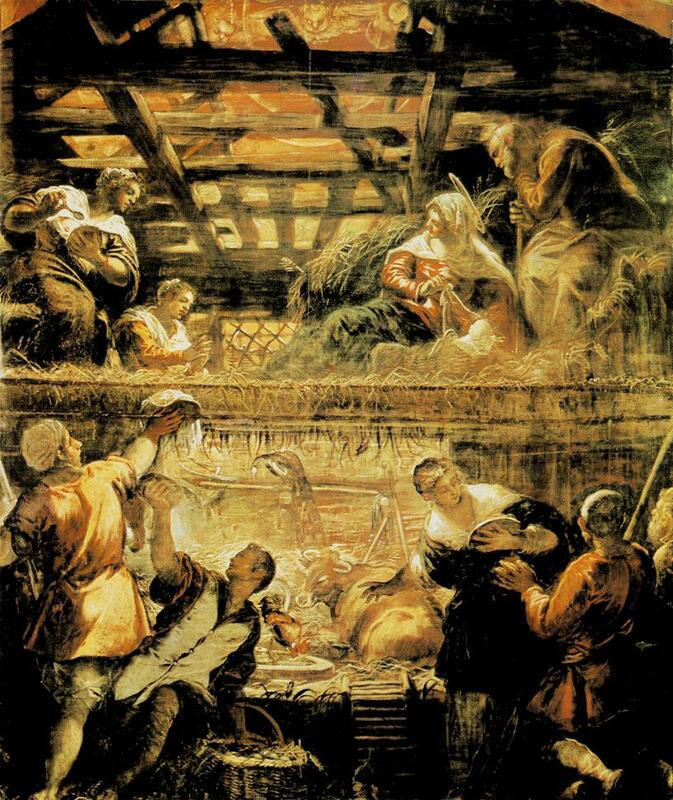 Jacopo Tintoretto (Italian "Mannerist" painter,1519-1594), "Adoration of the Shepherds" or "The Nativity" (c. 1579-81). Oil on canvas. Scuola di San Rocco, Venice. Another. 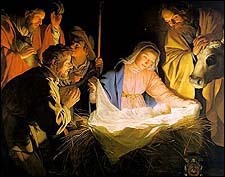 Louis Le Nain, Adoration of the Shepherds (1630-32), Oil on canvas, Mus�e du Louvre, Paris. Incarnation Window, Cathedral of Chartes, France. Detail. 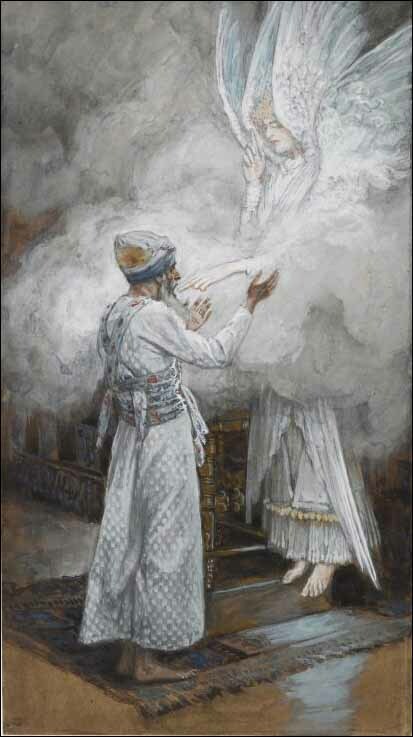 Dante Gabriel Rosetti (British Pre-Raphaelite painter, 1828-1882), The Adoration (1858-64), watercolor on paper, 406x292 mm, from the Seed of David. Tate Collection. Giotto di Bondone (1267-1337), Adoration of the Magi. 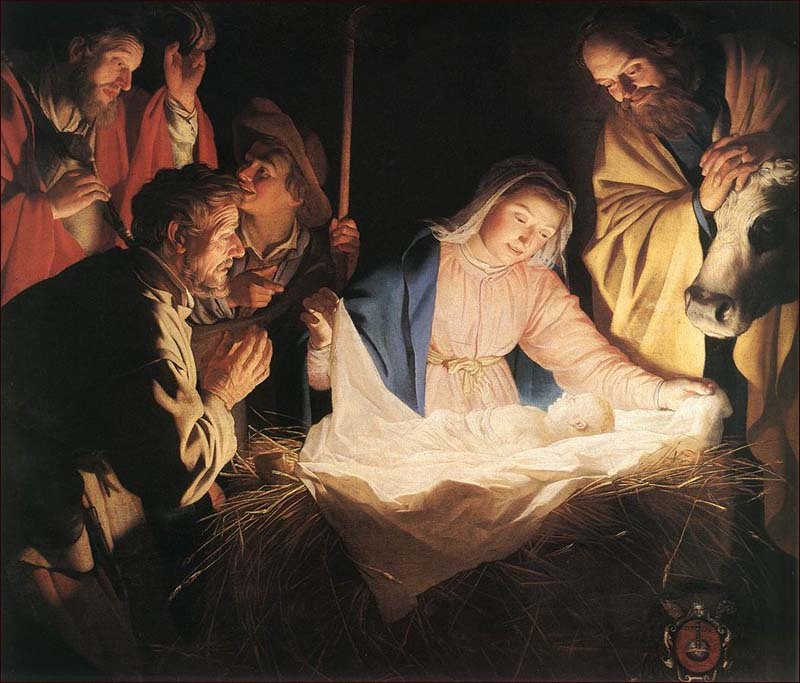 The Star of Bethlehem is shown as a comet. Giotto had witnessed Halley's Comet in 1301. 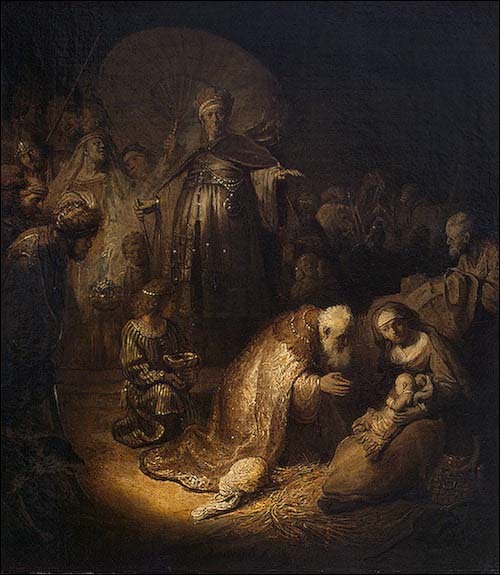 Rembrandt, "The Adoration of the Magi" (1632), Oil on paper pasted on canvas, 45x39 cm, Hermitage Museum, St. Petersburg. 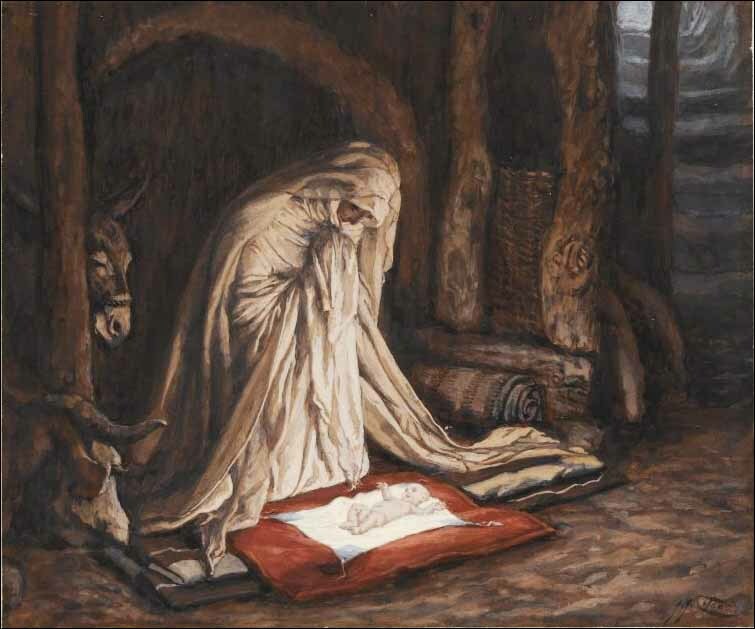 Notice the tenderness of the wise man kneeling before the baby! 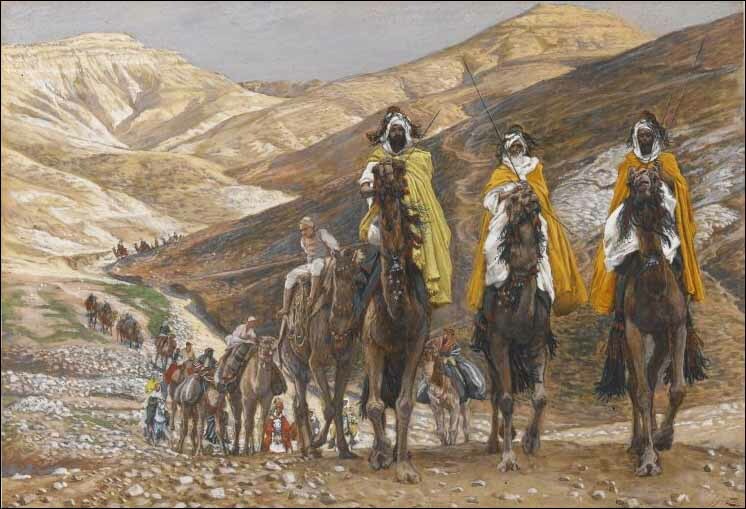 Tissot, The Journey of the Magi (c. 1894), oil on canvas, 70.8 x 101.6 cm, Minneapolis Institute of Arts. Another. Another. El Greco, Adoration of the Wisemen (). Diego Vel�zquez. The Adoration of the Magi (1619), oil on canvas. Museo del Prado, Madrid, Spain. Hans Memling. Triptych: The Nativity, The Adoration of the Magi, The Presentation in the Temple. c.1470s. Oil on panel. Museo del Prado, Madrid, Spain. Sandro Botticelli, Adoration of the Magi (1475-76), oil on panel, 111x134 cm, Uffizi, Florence. Another. Another. Another. Albrecht Durer, Adoration of the Magi (1504), 76x89 cm. Uffizi, Florence. Another. Another. Pieter Brueghel the Younger. Adoration of the Magi. Oil on canvas, transferred from panel. The Hermitage, St. Petersburg, Russia. Another. Cosme Tura (1430-1495), Adoration of the Wisemen (1474), Ferrara. 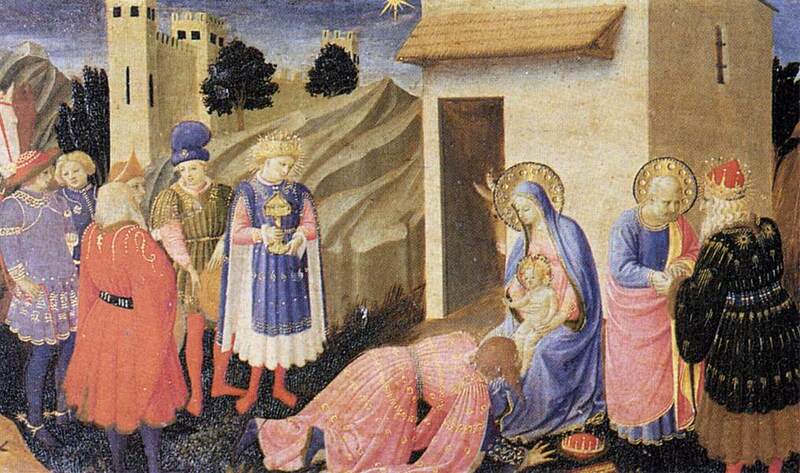 Fra Angelico and Fra Filippo Lippi, Adoration of the Magi (c. 1440/1460), National Gallery of Art, Washington DC. Another. Fra Angelico and Benozzo Gozzoli. Adoration of the Magi. (1438-1444/45). Fresco. Cell 39. San Marco, Florence, Italy. Another. Linaiuoli Tabernacle: Adoration of the Magi. 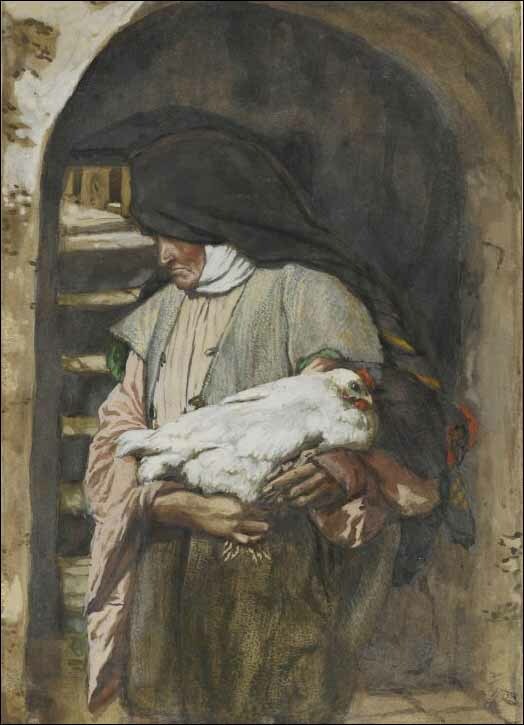 Predella. 1433. Tempera on panel. 39 x 56 cm. Museo di San Marco, Florence, Italy. Another. Filippino Lippi, Adoration of the Magi (1496), oil on panel, 258x243 cm, Uffizi, Florence. Another. 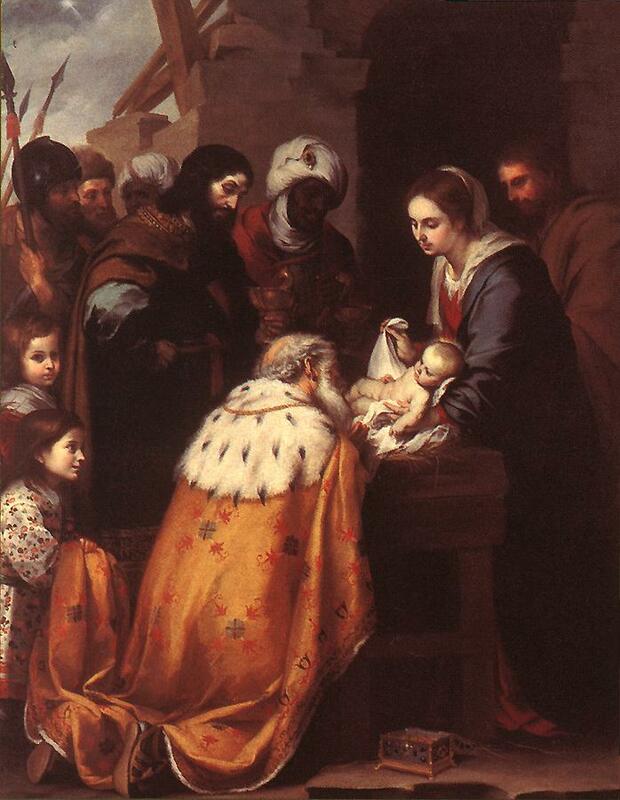 Francisco de Zurbar�n, Adoration of the Three Kings (1638), Mus�e des Beaux-Arts, Grenoble. Hans Holbein, Adoration of the Three Kings (1521-1522), Freiburg im Breisgau, Munich. Domenico Ghirlandaio, The Adoration of the Magi (1488) Spedale degli Innocenti, Florence. Leonardo da Vinci, Adoration of the Magi (c. 1481-82), underpainting on panel, 97 x 96", Uffizi, Florence. Very yellowed in appearance. Dirk Bouts, Adoration of the Magi (1467-68). 63x62 cm, Alte Pinakothek, Munich. Andrea Mantegna, Adoration of the Magi (1462), Tempera on panel, 76 � 76.5 cm, Uffizi, Florence. Another. Leonaert Bramer, Adoration of the Magi (c. 1633-35). Three Wise Men or Procession of the Magi (1459-1461), fresco in the Magi Chapel of Palazzo Medici-Riccardi, Florence. Fra Angelico and Benozzo Gozzoli. 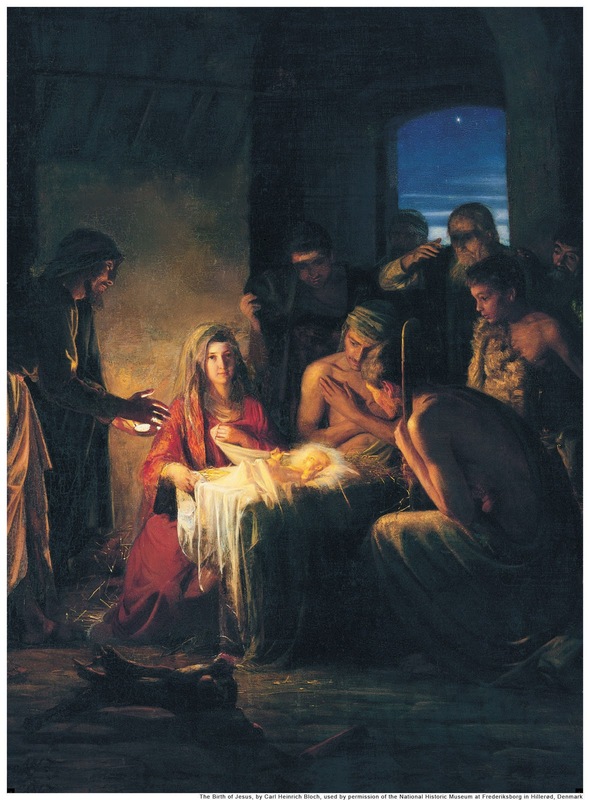 Adoration of the Magi. (1438-1444/45). Fresco. Cell 39. San Marco, Florence, Italy. Affresco La processione dei Magi (part. ), Firenze, Palazzo Medici - Riccardi. Another. Jan Gossaert, Adoration of the Kings (c. 1505), National Gallery, London. Gentile da Fabriano, Adoration of the Magi (1423), Tempera on panel, 203 � 282 cm, Uffizi Gallery, Florence. Hieronymus Bosch, Adoration of the Magi, center panel of triptych (c. 1495), The Bronchorst Bosschuyse Triptych. Prado Museum, Madrid. Another. 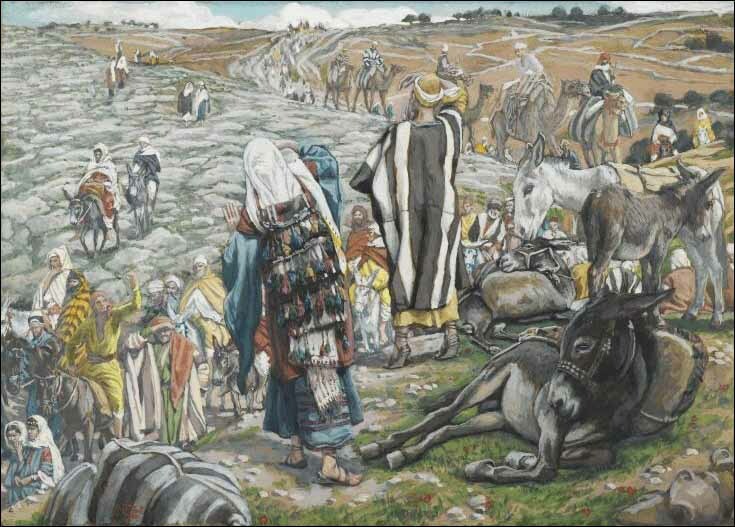 Collection in Wikipedia article Adoration of the Magi. Pictures. Giotto di Bondone, Three Kings (detail). Cappella degli Scrovegni all'Arena, Padua. Sassetta, Journey of the Magi (c. 1435), Tempera and gold on panel,Metropolitan Museum of Art, New York, Originally the upper part of a small "Adoration of the Magi" now in the Palazzo Chigi-Saraceni, Siena. Miniature of the Magi and of Herod (early 13th Century), Psalter at Oxford, in the British Museum. 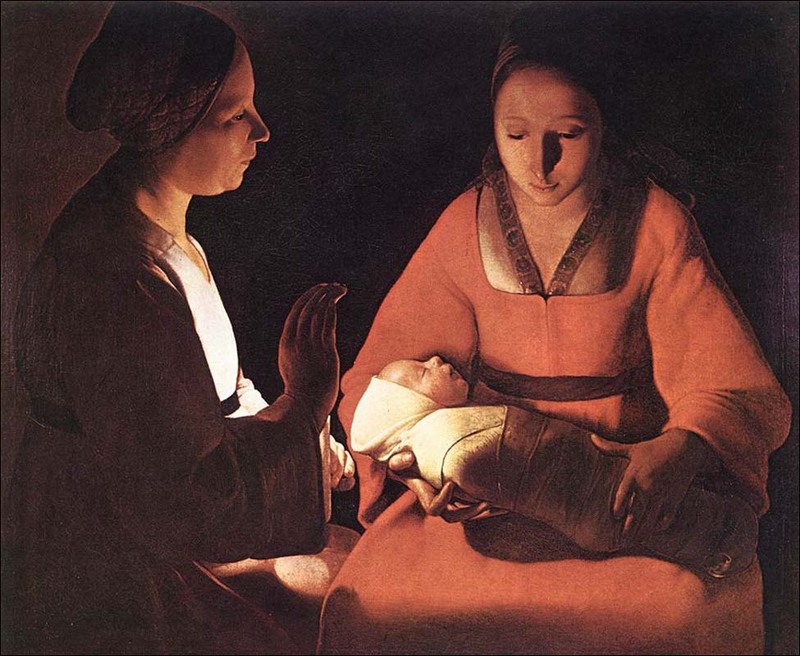 Gerard (Gerrit) van Honthorst (1590�1656). 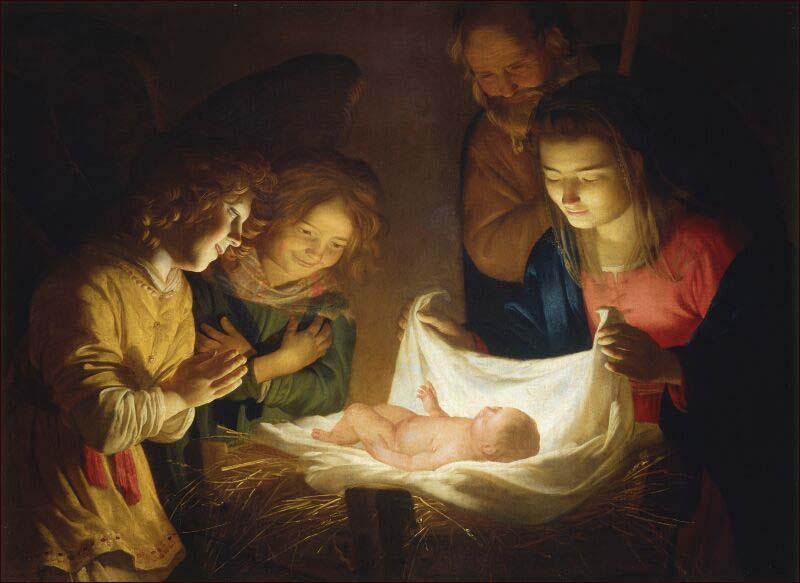 The Childhood of Christ (c. 1620), Hermitage, St. Petersburg. 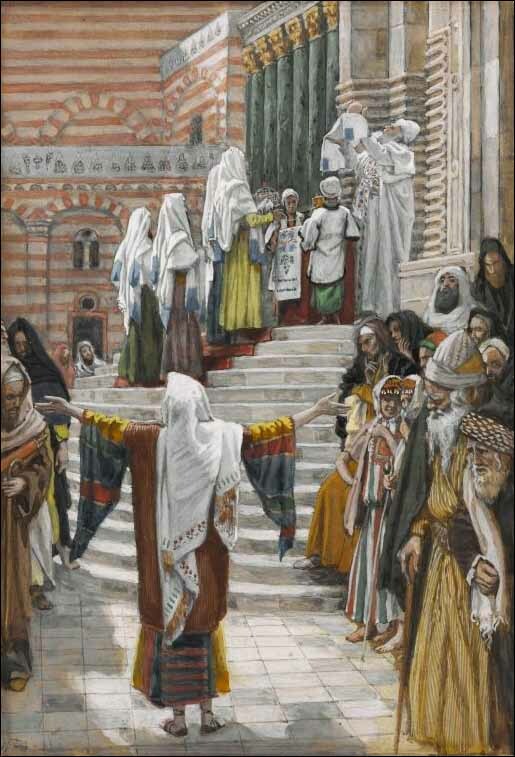 De jeugd van Jezus (1620), olie op doek, Hermitage, St. Petersburg. 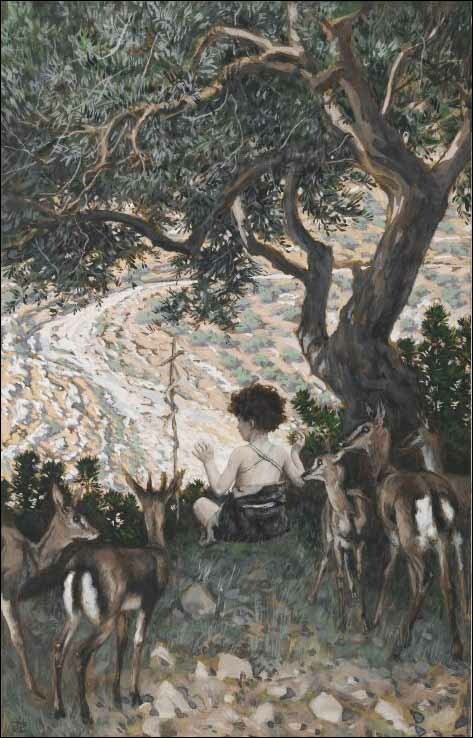 Camille Boiry, The Child Jesus in His Workshop (1909), oil on canvas, .38m x .46m, Galerie Madaba. William Holman Hunt, The Shadow of Death (1870-73), oil on canvas, 212 x 167.6 cm, Manchester City Art Galleries, Manchester. 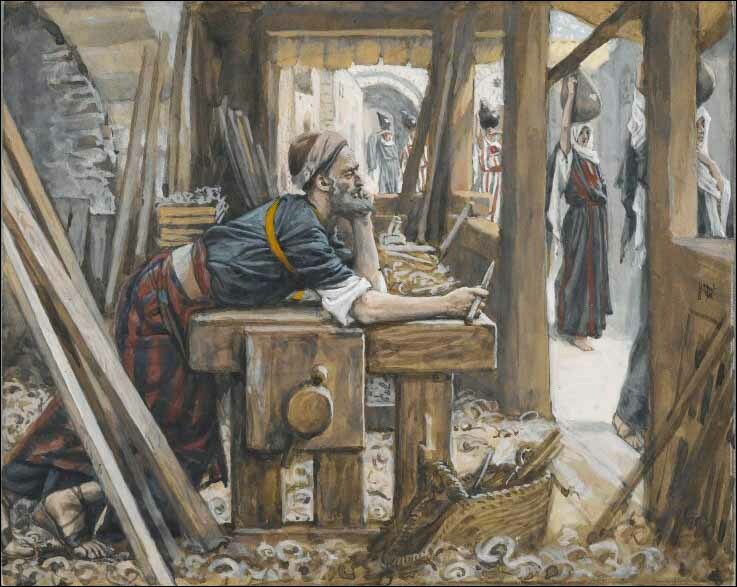 Realistic painting of adult Jesus in carpenter shop with arms spread as if on cross. Sir John Everett Millais. 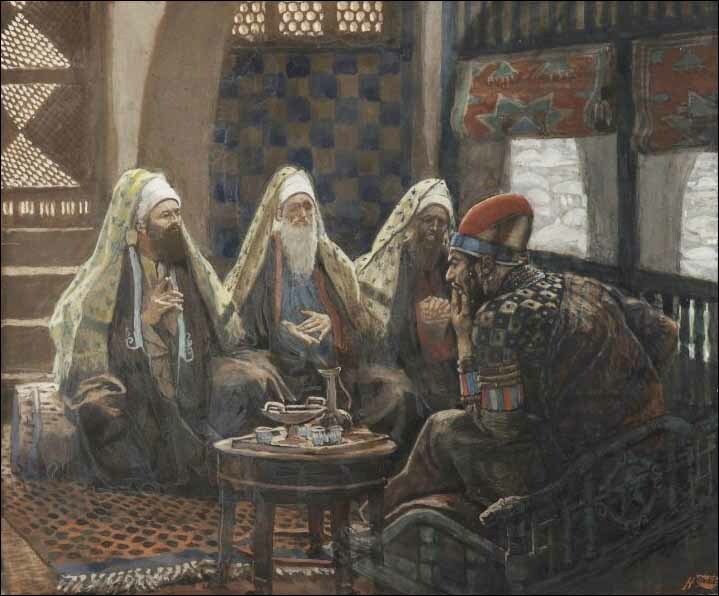 Christ in the House of His Parents (1849), Oil on canvas. Tate Gallery, London, UK. Jesus is a teenager in this picture. 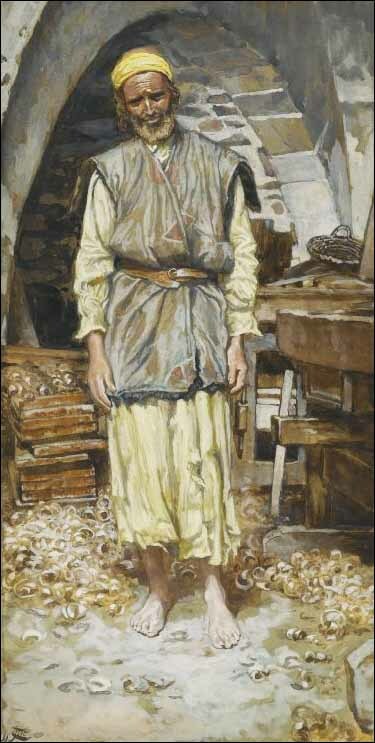 Edward Stott, The Carpenter's Shop (c. 1913), oil on board. Royal Academy of Arts, London. 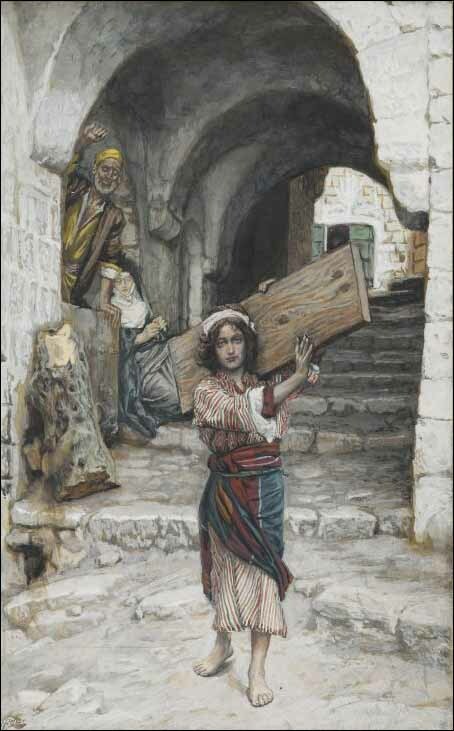 The Young Jesus, Jesus carrying a board in city streets. 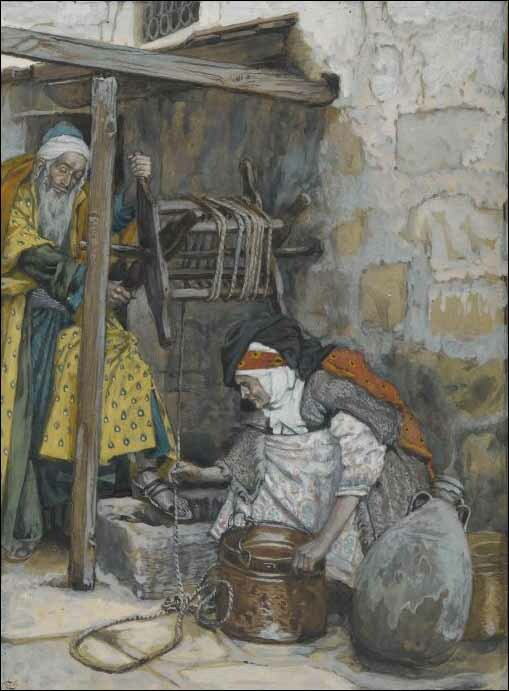 Jesus and his mother at the fountain. 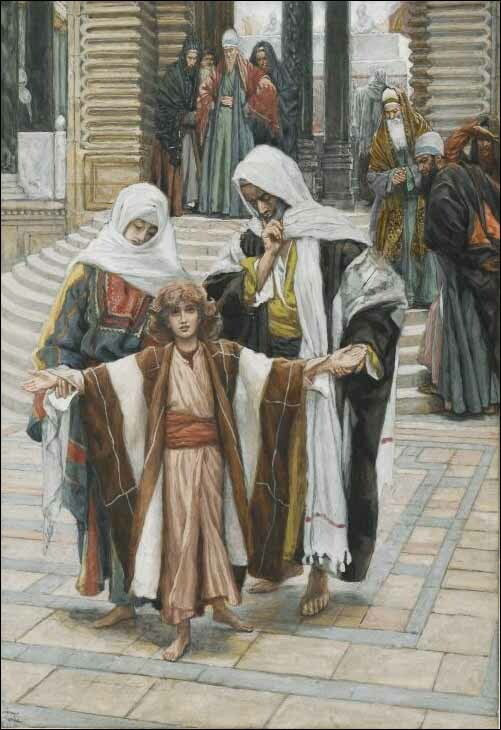 Carl Heinrich Bloch, Teaching in the Temple, boy Jesus in temple, oil on copper plate. Joseph von Fuehrich, The Virgin Mary's Walk Across the Mountains (1841). Time Magazine. St. Joseph picking up a rose behind Mary. OESTERREICHISCHE GALERIE. St. Joseph and the Christ Child (early 18th Century). Painted by an unknown artist in Cusco, Peru. Denver Art Museum. School of Cuzco, St. Joseph and the Christ Child Enthroned with Four Angels (c. 1700-1740), private collection. St. Joseph's University, Philadelphia. Piazzetta Giambattista, Death of St. Joseph (c. 1740). Art Museum of Estonia. Pietro Perugino, detail of Marriage of the Virgin Mary, detail, (1500-1504), Musee des Beaux-Arts. Full image. 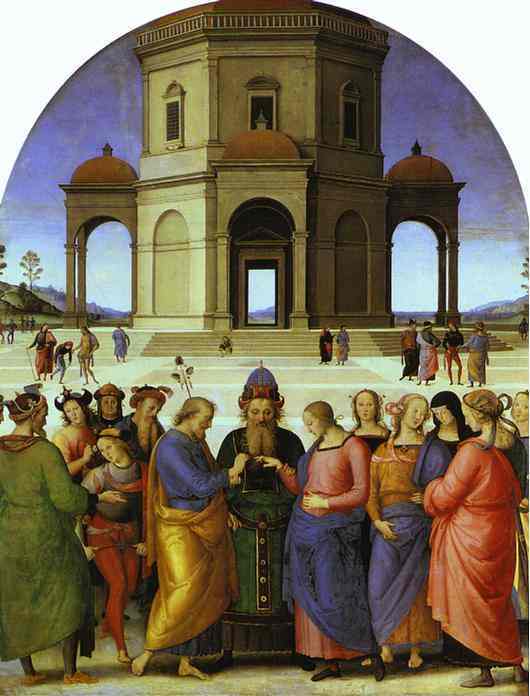 Raphael, Marriage of the Virgin (1504), after Perugino, Oil on panel. Pinacoteca di Brera, Milan. The Holy Family with a Small Bird (c. 1650), Museo del Prado, Madrid. Another. 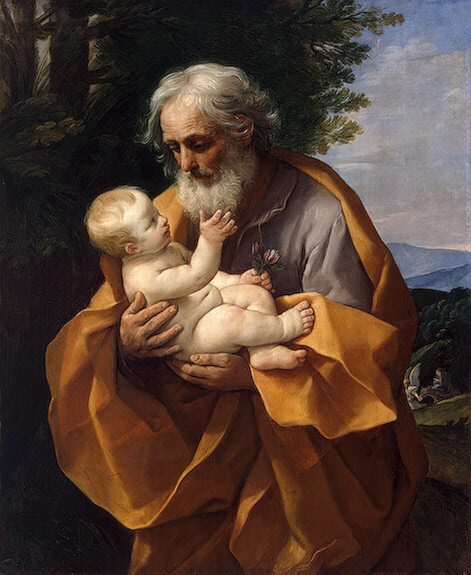 Joseph with Infant Christ (1665-1666), oil on canvas. Museum of Fine Arts, Sevilla, Spain. 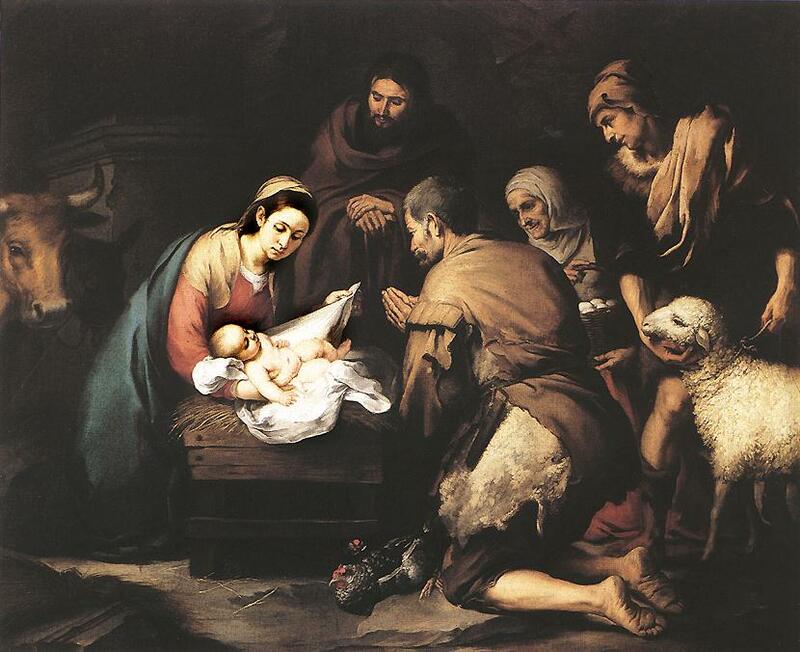 The Adoration of the Shepherds (1650-55) , Oil on canvas, 187 x 228 cm, Museo del Prado, Madrid. Another, In Time Magazine, Dec 13, 2004. El Greco, St. Joseph and the Christ Child (1597-99), oil on canvas, Chapel of San Jos�, Toledo, Spain. "Joseph and the Child Jesus"
Rogier van der Weyden. St. Joseph (c.1445), oil on panel. Fundacao Calouste Gulbenkian, Lisbon, Portugal. Master of Fl�malle, St. Joseph in his workshop (c. 1427), oil on wood, Metropolitan Museum of Art, New York, right wing of the Merode Altarpiece. Louis S Glanzman (1922- ), Joseph with Baby Jesus, Joseph with tools, Jesus asleep in hammock, contemporary, mixed medium on art board, 20x15-1/2". 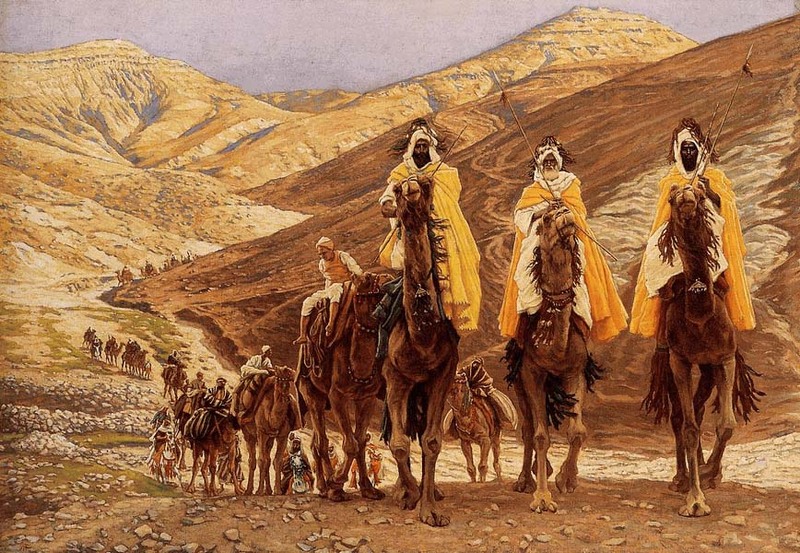 Men of the Bible series. Flight to Egypt, Crossing a Brook, etching and drypoint, 97x145 mm, Open Eye Gallery, Edinburgh. Wolf Huber, Flight into Egypt (1525-30), 56x57 cm, Gem�ldegalerie, Berlin. Colorful! Fra Angelico, Flight into Egypt (1450), 38.5 � 37 cm, Museo di San Marco, Florence. 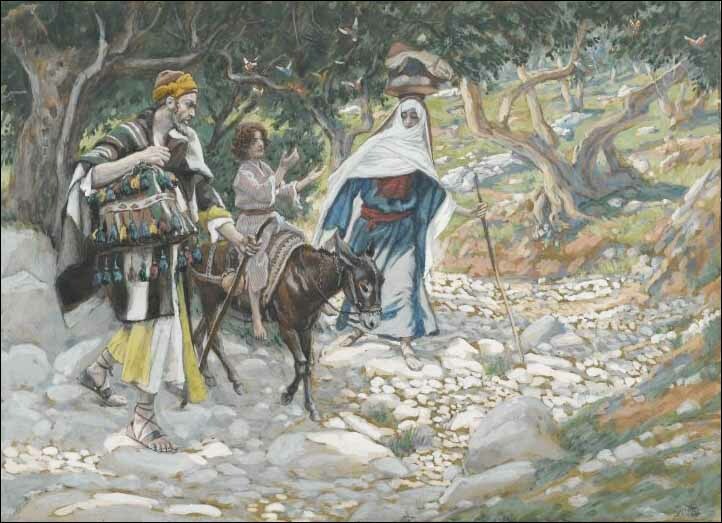 Carl Heinrich Block, Flight into Egypt, oil on copper plate. 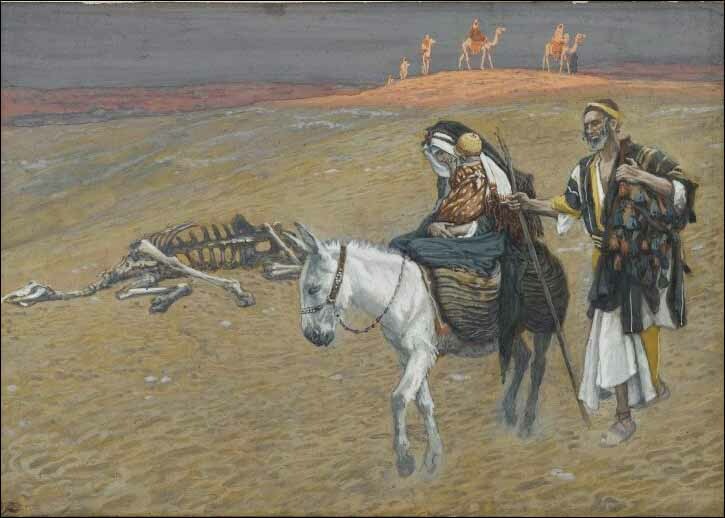 Flight to Egypt painting, Cathedral of Spilled Blood, St. Petersburg. Excellent! The Art of Joseph, Dec 13, 2005. You can also find Christmas stories and articles elsewhere on the site.